The city of Ohrid (sometimes referred to as “Jerusalem”) on the shores of Lake Ohrid in the Republic of Macedonia, supposedly it once had a church for each day of the year, 365 in all. The city and the lake are both UNESCO Cultural and Natural World Heritage Sites due to the architecture, monuments and beautiful countryside. In addition to its popularity, Ohrid’s location nearby Skopje, Resen, Bitola and the Albanian border makes it easy to visit. Many conquerors, including the Romans, South Slavs, the Bulgars, the Byzantines, the Ottoman Turks, the Normans and even the Venetians have left traces of their occupations. The city was eventually freed from the Ottomans by the Serbian army in 1912, in turn ousted by the Albanian and Internal Macedonian Revolutionary Organization in 1913. Lake Ohrid and its environs are wonderful to visit, particularly during the spring and autumn in order to avoid the crowds. The Ancient Theatre of Ohrid is very pretty in the spring. The Balkan Festival of Folk Songs and Dances (beginning of July) is closely followed by the annual Theatre and Music Summer Festival (July to August), then by the Choir Festival at the end of August. The August four day Ohrid Fest, featuring Folk, Pop and International music is also pretty good. 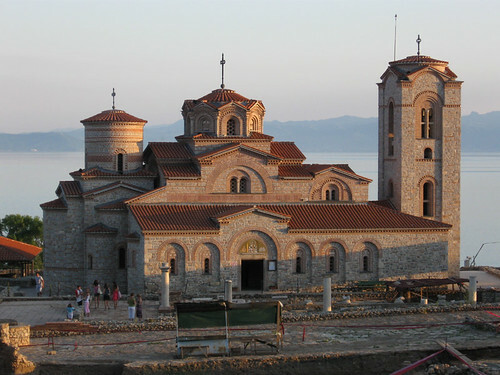 With the exception of some Serbian late Middle Ages churches, most of Ohrid’s surviving churches are from the Byzantine and Bulgarian eras. The Church of St. Vrači contains 14th century frescoes, while the Churches of St. Sophia, St. Panteleimon, St. Petka, St. Zaum, St. John at Kaneo and St. Naum are all of note. The 4th century early Christian Basilica of St. Erazmo is also worth visiting. At Plaošnik, the site of a 10th century University is now a restored Monastery, while the Ochrid museum of archeology is at the Robevi family house.